Originally published on HHOttawa’s blog on Medium. What would an ex-military engineer, dentist, recent graduate, and industry professional have in common? Each has the profound desire to bring their healthcare vision to light in the hopes of helping the world. With experience of negotiating their way through the challenges of starting up their own healthcare companies, this diverse panel offered a number of insights into the world of startup in the healthcare field and kindly shared their expertise with the aspiring entrepreneurial enthusiasts in attendance. 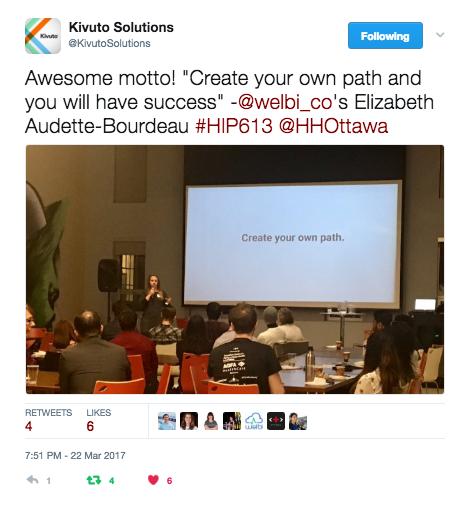 On March 22nd, a congregation of Hacking Health enthusiasts, entrepreneurs, developers, and aspiring world-changers we were afforded quite a bit of “wiggle room” at the heart of Kivuto Solutions Inc., a software distribution company that specializes in hosted electronic software delivery. Vivek Raju, AVP Operations, warmly welcomed into this engaging space, with elaborate wall paintings, kitchenette, and even outfit with a central slide. 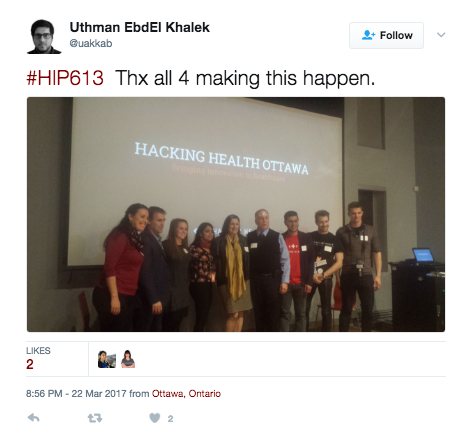 Having been immersed in the tech communities of Ottawa for a number of years, he explained how Hacking Health Ottawa has added considerable value since its inception about two years ago. Hacking Health’s Haidee and Karine kicked off the session reiterating the Hacking Health mission and its objective in bringing together individuals who might not normally collide in the day-by-day. Through these events, the ecosystem of health initiatives become increasingly enriched with expertise across a broad range of disciplines so as to bring together new ideas, new ways of thinking, and promote collaboration within a dedicated innovative space. This evening was one to inspire the successes of startups in the health space with talks from four entrepreneurs willing to share their experiences. Our first panelist, Suzanne Grant, Cofounder and CEO at iBionics, is a serial entrepreneur with over 20 years of experience. Beginning her career in the armed forces, she intrinsically knew herself to be an entrepreneur and sought opportunities to develop solutions for those in greatest need, but did not know what exactly this would entail at the time. While on military tour in Rwanda during the 1994 genocide, she and her troops came across 900 orphaned children and she was struck with the innate desire to help in any way that she could. Calling her husband, she asked a question that would then introduce her into the Social Entrepreneurial space: “Can you send a blanket?” That one blanket would serve as a small kindness to a single child trapped in a darker place and time in the history of the world. Suzanne wondered about what would happen to the remaining 899 orphans and quickly drew the parallel between the abilities of the fortunate to help those in need and saw herself a facilitator in connecting the two. Within eight weeks, she succeeded in delivering over 18,000 kilograms of blankets and supplies to these children in greatest need by engaging a country with a heart set on helping. She explains that once she witnessed the success of this initiative, she could not stop. Suzanne eventually moved to Qatar during its pre-cosmopolitan era, when it was emerging as a booming economy in the Middle East. With her technology and operations background from her time in the armed forces in addition to her recent entrepreneurial, successes she was poised to implement her vision at the intersection of social initiatives, publishing, and technology. She pioneered into the publishing domain in a country saturated in censorship, with initiatives like “Art of Business” and “Spirit of Empowerment” which sought to empower women in Qatar. Explaining how these efforts skirted the fringe of potential imprisonment due to their radical nature in a patriarchal society, she proudly describes the foundational change that it introduced in challenging the status quo of women in Qatar society. Thereafter she turned her sights to tech with the goal of improving the quality of life for the blind. She described the iBionics Diamond Eye as a world-sensing interface over the retina to recreate vision for the blind. Requiring an implantable chip and a software layer, this work was only enabled due to the multi-disciplinary expertise of those involved. She emphasized how neurotechnology has a high barrier to entry but is moving towards becoming a billion dollar industry and that they position themselves in the wireless transmission space. Envisioning an Apple-like approach where hardware will remain fixed and the company can then roll out improving software over time, she describes the aesthetic appeal to her solution as compared to other competitors. She explains that one of the biggest challenges the company faces is deciding between all the possible directions that they can take the company, given the plethora of options! A dentist with over 20 year of practical experience, Dr. Lamarre described the need for innovation in dentistry. One of his colleagues and mentors, Dr. Burton Siegel, had the first papers linking gum disease to heart disease, and subsequently discovered its correlation to an even broader number of health problems. This oral-systemic health link became the foundation of an entire body of research, however there existed fundamental limitations to the technologies currently used in the dentistry profession. Dr. Lamarre described the history of the periodontometer: invented in 1880, used to measure the depth of gum, and has not been improved upon in the 130 years since. Dr. Lamarre wished to develop a new state-of-the-art technology by creating voice-activated charting system to then create a fully recreated three dimensional model for dental charting. With the hopes of pushing the field of dentistry from its current reactive state into a more proactive one, Cumulus Dental hopes to improve the ability for early detection of gum disease in patients with the hopes of preventing some of the system health problems now known to be associated. The technology barriers faced by the Cumulus Dental team were tremendous since the field had very little in the way of software and community development. Intending to develop a handheld probe (to be released in 2018) as part of their solution framework, the team faces significant challenges in packing a large amount of functionality into a device no larger than current dentistry tools. Dr. Lamarre emphasizes money as the biggest barrier in addition to the need to a fantastic team of motivated individuals. The third and youngest panelist Elizabeth Audette-Bourdeau, Cofounder and CEO at Welbi, already had the success of two initiatives behind her and now spearheading the third into the healthcare market. Elizabeth’s ambition for her talk was to convince the audience to turn their ideas into a viable business. Her motivation to establish Welbi was the result of a personal story involving the declining health of her grandparents and the severe lack in the ability to track their daily conditions. Frustrated about the lack in monitoring activity, she was inspired to resolve this problem herself and founded Welbi in 2016. Using existing wearable technologies such as a Fitbit®, Welbi can automatically track data about a loved one and learn about daily activity patterns so as to trigger a warning if ever someone appears suddenly outside of the norm (such as restless sleeping, changing heart rates, etc). This framework allows remote and improved resolution about the wellbeing of a loved one. “There was no ‘Build your own Uber Startup’ book when Uber was first developing their company”. She emphasized the need for focus as the startup environment can be fraught with distractions which threaten your efficacy as a team with a goal. Additionally, she provided examples about how the startup process is a highly dynamic space where one’s goals and focus will change through each stage of the company and that founders (i.e. “your family”) should be intrinsically self-reflective and selective about the decisions they make as each will impact the company in various ways. Our final panelist, Michel Paquet, Founder and CEO at Aetonix describes his pivotal moment to transition from being a “typical employee” to startup culture at a conference in Toronto upon hearing a talk by Canadian astronaut Chris Hadfield he describes as “a hugely passionate individual and excellent speaker”. Michel realized that he had more to offer to the world and trusted in his entrepreneurial calling. At the time his father was fighting cancer and his aunt had Alzheimer’s and he faced a similar situation to Elizabeth with her grandparents and struggled with the idea that no system for tracking the care of complex patients existed. Research shows that complex care patients represent a massive portion of the federal and provincial healthcare budgets and that any opportunity to reduce the readmission of complex care patients would alleviate a financial burden on healthcare systems. At the same time, a patient receiving equivalent quality of care at home would see improvement in their quality of life. Mr. Paquet, through Aetonix, sought to develop a method to connect “care coordinators” in an intelligent way so as that a patient would receive the best possible care while remaining in the comforts of their own homes. As each has a dedicated “complex care plan” to adhere to, it is necessary for administrators of that care have a standardized framework to track the delivery of that care; cue the Aetonix solution. The panelists went on to answer a round of questions from the audience on topics such as the efficacy of networking and other topics critical to the establishment of startup success. Each synergized their answers based on the other’s, providing a comprehensive sense for the journey into and through startup culture while imparting a buzzing sense of excitement at the potential of bringing an idea to fruition. Thereafter, the congregation broke for generalized networking with that sense of excitement lingering in the air. This panel set the stage for the exciting possibilities that will be enabled by the Hacking Health Hackathon with our anchor partner CHEO-OCTC! Are you a developer, designer, policy analyst, artist or engaged citizen with a vested interest in healthcare? We invite you to get involved, and look forward to seeing everyone again as we gear up and get ready for our April Hackathon. 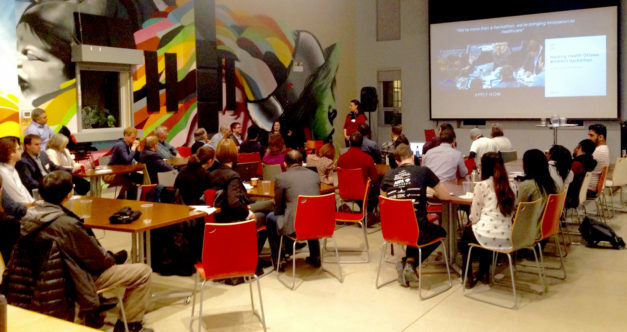 Sign up here for the Hacking Health Ottawa newsletter and to stay up to date on all upcoming event details.